That's pretty much what Barry Zito did to Prince Fielder yesterday because of that whole "bomb" celebration last year. (see the nicely inserted picture above) Zito wasn't even pitching when Prince went bridge 6 months ago against SF but it didn't matter much to Zito. From the looks of it, it didn't matter much to Prince either because his mighty back fat kind of just rejected the ball from his body and he quietly jogged down to first. No brawl, nothing more than Prince getting poked. 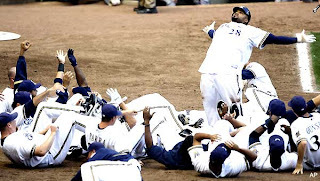 The one thing that will make me watch National League baseball this year, well besides my addiction to fantasy baseball, is seeing what other celebrations Prince can come up with.